This written report has been prepared by Mel Ulmer, any errors should be attributed to him. This report is a much-condensed version of work that has been done over the past several years at Northwestern University and or in collaboration with Northwestern University. Figure 1 is the result of films made by F. Shahedipour and B. W. Wessels (Northwestern), photo-cathode fabrication by Hamamatsu Corporation (contact, Ken Kaufmann ), and testing by both Hamamatsu and Charles Joseph (Rutgers). Figure 2 is from a presentation produced by Roman Y. Korotkov and Bruce W. Wessels (Northwestern). Figure 3 (as Si micro-channel plate) is from Oswald Siegmund (Univ. of Cal. Berkeley). Figures 4 and 5 are from a presentation produced by P. Sandvik, D. Walker, P. Kung, K. Mi, F. Shahedipour, V. Kumar, X. Zhang, J, Diaz, C. Jelen, and M. Razeghi (Northwestern). Ulmer has been working with two groups that are taking different paths to producing imaging devices that have high quantum efficiency in the UV and extremely low efficiency in the visible. We remind the reader that there are many scientific drivers ct http://casa.colorado.edu/~uvconf/UVOWG.html and for wanting to image the universe in the UV, but that unless filters are employed with currently available devices, the images are too contaminated with visible light to be of much use. For, most astronomical sources are much brighter in the visible than the UV. GaN based films show the promise to meet this need as the materials are wide-bandgap semi-conductors (cf. Ulmer, Razeghi, and Bigan, 1995 and Ulmer, 1997, and references therein). One path we have followed is with Prof. Bruce Wessels, Hamamatsu Corporation (contact Ken Kaufmann) and Charles Joseph and in the future we plan to work with Oswald Siegmund. This path is to make photo-cathodes that can be merged with some imaging system such an EBCCD or a micro-channel plate. The material must be p-type to reduce the work function at the surface due to band-gap bending. As nature would have it, it is more difficult to make p-type material with high carrier concentrations than n-type. With the usual limited funds and manpower, we have not been able to make systematic tests, but we suspect a large part of the increase in the photo-cathode efficiency from our first to second try (cf. Figure 1) is due to improving the carrier concentration from about ~5E16 to 2E17/cm^3. We have been stymied as we cannot work too closely with a commercial company and we don't know how much, if anything was done differently between the two runs in terms of converting the films into a photo-cathodes. However, we are very excited about our ability to use co-doping to increase the carrier concentration of p-type material to 2E18/cm^3 (Figure 2) and look forward to see the results of photo-cathodes made with this material. After we are convinced that we have achieved high enough carrier concentrations (and 2E18 may be there) as to have reached the point of diminishing return (predicted values over 40% for semi-transparent photo-cathodes and even higher for opaque photo cathodes used in EBCCD type configurations), we will then concentrate on placing these films into imaging devices. When we worked with Hamamatsu (HPK) we delivered a film deposited on sapphire and HPK converted the material into a photo-cathode and then inserted this in phototube. Chuck Joseph then made independent measurements of the quantum efficiency and extends the range to higher energies/shorter wavelengths than HPK. In the future we plan to send the same type of films to both Oswald Siegmund and to HPK. Oswald Siegmund's group will give us invaluable feed back as to how the carrier concentration and resistivity of the films (our current values are 2-5 Ohm-cm) affects the QE of the photo-cathodes versus the activation that Siegmund's group performs. We will also work with Oswald Sigmund on methods of directly depositing the films on a Si micro-channel plate (Figure 3). He will provide us with the micro-channel plate. Si plates are needed to withstand the temperatures at which the films are fabricated. Although the photo-cathode approach is quite promising, solid-state detectors are much more compact, more robust, can achieve higher quantum efficiency, and are operated at much lower voltages than the photo-cathode based devices. It also is probably easier to tune (via alloying) the band-gap of (at least some of) these devices rather than tuning the p-type materials needed for photo-cathodes. We are, therefore, strongly motivated to produce solid-state devices. This is the other path we are following. At Northwestern we have the facilities to fabricate and evaluate both p-i-n as well as n-type MSM (metal semi-conductor-metal) devices, (Figure 4) Prof. Razeghi's group holds the record for the best responsivity at 360 nm (0.20 A/W) ( Figure 5). In Figure 5 we also present the impressive quantum efficiency and sharp wavelength-cutoff to the responsivity of these devices. Besides the probable complications of making a fully functional devices (e.g. one of us [Mel Ulmer] has been told there are over 100 steps in fabricating a CCD), the technical challenges are: (1) the dark current is still too high for single photon-counting, i.e. between 8E-5 to 6E-6 nAmp/micron^2 [uncooled] vs. 1E-14nAmp/micron^2 for CCDs [cooled] (2) some kind of amplification must be applied as only about 1 electron is injected into the conduction band per incident photon. The biggest challenge seems to be to reduce the dark current to acceptable levels for low-light level/astronomical applications. The main route to reducing the dark current is to reduce the number of lattice defects and to make ohmic contacts (as opposed to rectifying ones) with minimal resistivity. We are continuing to vary the growth conditions and our approaches to lattice matching with the substrate to reduce the defects, and we are varying the fabrication of the contacts to reduce the resistivity of the ohmic contacts. Given the relatively wide-band gap (3.4-6.2 eV) of these films the plan has been to operate at room temperature; however, it may be necessary to cool these devices to achieve the dark current levels required for astronomy. Given the promise of the solid state devices and the advances that have been made, "the game is worth the candle" and we will continue to work on making better and better solid state detectors, with goals of: 60-90% QE above the bandgap and 1E-8 QE below the bandgap, CCD-like dark currents, and operational temperatures in the 20C-25C range. These attributes are theoretically possible, and we hope it is just matter of time and money to make detectors with these (above listed) attributes a reality. SPIE Feb 1995 San Jose ConferenceProceeding, vol. 2397, p 210 (1995). 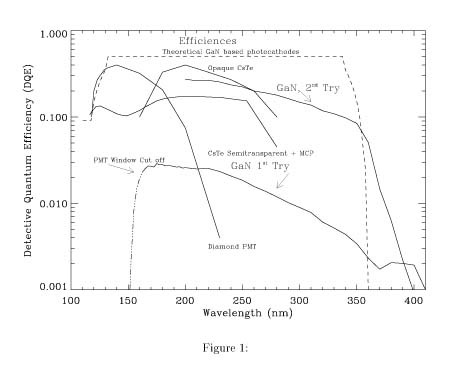 Ulmer, Melville P., "Requirements and design considerations of UV and x-ray detectors for astronomical purposes," Proc. SPIE Vol. 2999, p. 259 (1997).